There are 21 currently operating colleges and universities based in the U.S. state of Vermont. This figure includes one research university, six master's universities, an art school, a culinary school, a law school, and a number of undergraduate associates and baccalaureate colleges. Four institutions chartered in other states offer degree programs at locations in Vermont. The state's largest school is its flagship public university, the University of Vermont. The other four public institutions are organized as the Vermont State Colleges system. The title of "oldest college in Vermont" is shared by three institutions. Middlebury College was chartered in 1800 and is Vermont's oldest operating college and the first institution to grant an academic degree (1802). Castleton University has its roots in successive institutions dating to 1787. The University of Vermont was chartered in 1791 but did not begin instruction until 1800 or grant a degree until 1804. 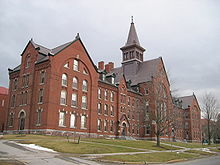 Vermont's newest college not formed from existing institutions is Landmark College, founded in 1984 to serve students with learning disabilities; it is also the most expensive college in the United States. The smallest college in the state, with 187 students, is Sterling College, a work college focused on environmental studies. All of these schools are accredited by the New England Association of Schools and Colleges, except New England Culinary Institute, which is accredited by the Accrediting Commission of Career Schools and Colleges of Technology. Albany College of Pharmacy and Health Sciences offers a Doctor of Pharmacy program in Colchester. Southern New Hampshire University offers graduate programs at a center in Colchester. Springfield College School of Human Services offers a degree program in St. Johnsbury. Union Institute & University in Ohio has a facility in Brattleboro. The Center for Cartoon Studies in White River Junction offers a Masters of Fine Arts program. Northeastern Baptist College in Bennington offers bachelor's degrees. Carnegie Foundation for the Advancement of Teaching. "The Carnegie Classification of Institutions of Higher Education". Archived from the original on 2008-08-22. Retrieved 2007-09-21. National Center for Education Statistics. "Integrated Postsecondary Education Data System". Retrieved 2007-09-05. U.S. News & World Report. "America's Best Colleges 2008". Retrieved 2007-09-05. ^ Campus tensions in Connecticut: Searching for Solutions in the Nineties. U.S. Commission on Civil Rights. 1994. p. 1. ^ CNN (October 28, 2005). "The 10 most expensive colleges". Archived from the original on October 22, 2007. Retrieved 2007-09-25. ^ Sterling College. "Mission and History". Archived from the original on 2007-10-02. Retrieved 2007-09-22. ^ New England Association of Schools and Colleges: Commission on Institutions of Higher Education. "Roster of Institutions". Archived from the original on 2013-08-28. Retrieved 2008-06-16. ^ Accrediting Commission of Career Schools and Colleges of Technology. "School Directory Search". Archived from the original on 2007-07-24. Retrieved 2007-09-22. ^ Enrollment is the total enrollment as reported by IPEDS for fall 2016. ^ Community College of Vermont. "Facts at a Glance". Retrieved 2007-09-05. ^ Landmark began transitioning to a 2- and 4-year college in 2012, with its first bachelor degrees expected to be awarded in 2016. ^ Landmark College. "The Landmark College Story". Retrieved 2007-09-05. ^ The enrollment count for Marlboro College includes 71 students at Marlboro College Graduate & Professional Studies, which is listed as a separate school in IPEDS. ^ New England Culinary Institute. "History". Archived from the original on 2007-08-23. Retrieved 2007-09-21. ^ School for International Training. "Virtual Campus Tour". Archived from the original on 2007-09-27. Retrieved 2007-09-05. ^ Vermont College of Fine Arts. "Vermont College of Fine Arts Progress Report January 2007—January 2008". Archived from the original (PDF) on 2012-09-20. Retrieved 2008-06-16. ^ Vermont Law School. "VLS Press Kit". Archived from the original on 2007-08-08. Retrieved 2007-09-05. ^ Vermont Higher Education Council. "Accreditation/Certification". Archived from the original on 2016-10-03. Retrieved 2016-07-12. ^ Vermont Agency of Education. "Postsecondary Education Approval". Archived from the original on 2016-08-12. Retrieved 2016-07-12. ^ Albany College of Pharmacy and Health Sciences (ACPHS). "Vermont Campus". Archived from the original on 2011-10-14. Retrieved 2011-10-04. ^ Trinity College of Vermont Association of Alumni and Friends. "Trinity Community". Archived from the original on 2007-09-29. Retrieved 2007-09-05. ^ Springfield College. "School of Human Services St. Johnsbury, Vermont". Archived from the original on 2011-10-04. Retrieved 2011-10-04. ^ Union Institute & University. "Locations". Retrieved 2015-05-29. ^ Art Toalston (September 17, 2014). "Baptist college gains Vermont accreditation". Baptist Press. Retrieved 2016-08-12. ^ Holm, Coralee (2016-05-16). "Burlington College Closes Academic Programs". Archived from the original on 2016-07-12. Retrieved 2016-07-03. ^ Castleton Historical Society. "Castleton Medical College Chapel". Archived from the original on 2012-09-20. Retrieved 2011-10-04. ^ Ohles, John F. (1982). Private colleges and universities, Volume 1. Greenwood Press. p. 736. ISBN 0-313-23323-3. ^ The College Blue Book: Narrative descriptions. Macmillan. 1987. p. 709. ISBN 0-02-695880-5. ^ Trinity College of Vermont Association of Alumni and Friends. "History of Trinity College of Vermont". Archived from the original on 2007-09-29. Retrieved 2007-09-05. ^ Council on Medical Education of the American Medical Association (1918). Medical Colleges of the United States and of Foreign Countries. American Medical Association. p. 16. ^ Putney Historical Society. "History Timeline 1500s-2004". Retrieved 2007-09-05. This page was last edited on 10 March 2019, at 01:03 (UTC).